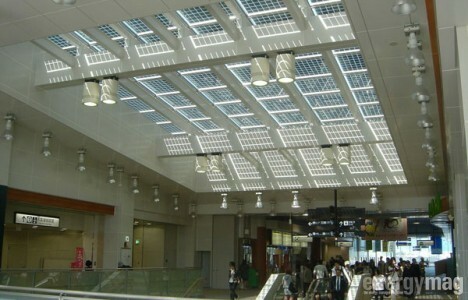 Also known as: SunEwat, sunjoule, BIPV, building integrated photovoltaics. 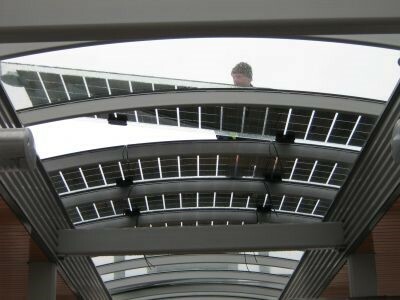 BIPV, or "Building Integrated Photovoltaics" is still a term not very well known but this will change very soon. The growth of this sector is estimated to be around 40% per year. 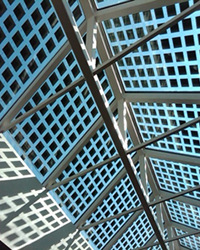 One of the first BIPV realizations are the semi-transparent PV products: glass with built-in photovoltaic cells. "Building Integrated Photovoltaics" implies that photovoltaic components are integrated in building materials. Initially, we are thinking at roofing or facades but it also includes windows and other glass surfaces by using semi-transparent PV modules. SUNGLASS, for example, is a semi-transparent safety glass with embedded photovoltaic cells that has the same properties as ordinary glass products for thermal insulation, acoustics, safety and light transmission. But above that, it produces energy in a way that is similar to PV panels on roofs. SUNGLASS is not only a product added to the building but it also replaces other glass products while maintaining their specific functions. The technology is quite simple. 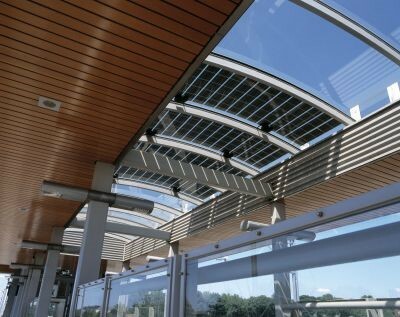 The solar cells are held in position between the front and rear glass plates and are protected from the weathering by the 'encapsulation' with a resin or plastic, such as polyvinyl butyral (PVB) or ethyl vinyl acetate (EVA). This encapsulation material protects against moisture and is resistant to high temperatures, temperature fluctuations and aging caused by UV radiation. The two glass plates are heat resistant. The outer one is made of a type with a low iron content because it allows a maximum amount of light energy. Solar cells of thin, square slices of crystalline silicon are located between both glass plates. Such solar cells are not transparent. But when these cells are separated from each other, the sunlight can shine between them and we get the term 'semi-transparent'. In other words, the translucency of the glass depends on the space between the cells. Glass-glass modules are usually delivered in dimensions depending on the wishes of the customer which is in contrast to non-transparent PV modules that are placed on roofs. The customer can also choose the number of solar cells per area glass, the amount of space between them and the thickness of the glass. 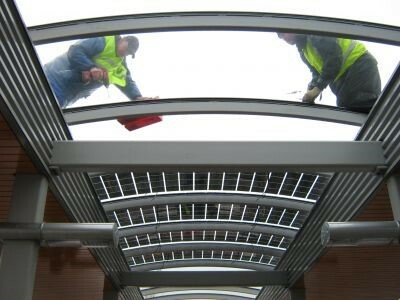 The outer glass pane is extra bright but for the inner pane there are more possibilities: clear, extra clear, colored, screen-printing, low-e coating, laminated... SUNGLASS is mainly used for facades, atriums, roofs, balustrades and in public buildings such as railway stations, airports, schools, hospitals or offices. In the residential sector it is used for porches but it is not appropriate to use it for windows that can open and close because these would reduce the efficiency. 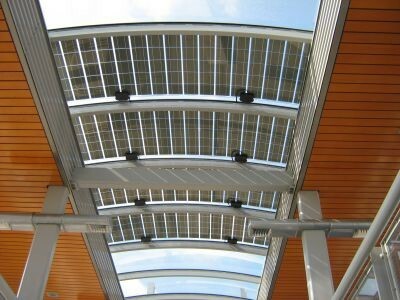 SUNGLASS guarantees an output of the rated power to 90% for the first ten years and then an efficiency of 80% for another ten years..
Due to the properties of cold bending, the photovoltaic cells can be applied in curved glass structures, making an investment not only interesting economically but it also contributes to the environment. That's why it is 'the' solution for architects who want to combine shape and innovation with environment-saving applications.